How to permanently delete a group in Ranger. Only users with role "admin" may delete a group. 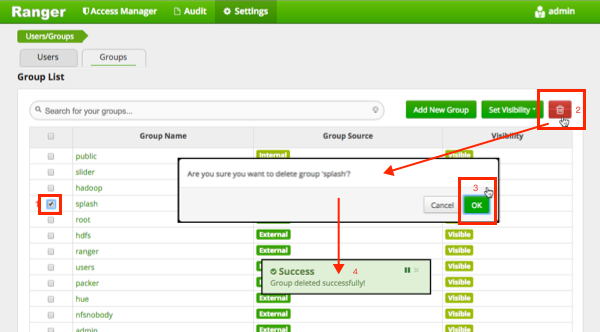 Select the check box of the group you want to delete and click the Delete icon ( ) at the right of the Group List menu bar. You are prompted to confirm the group deletion; select OK.
You receive confirmation that the operation has succeeded. Users in a deleted group will be reassigned to no group. You can edit the user to reassign it to groups.